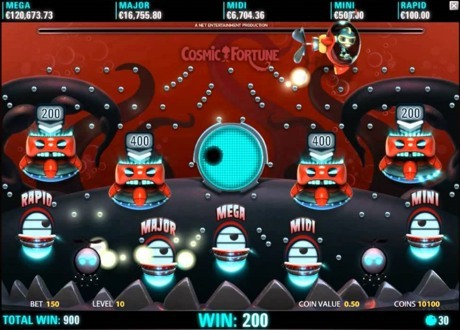 Cosmic Fortune is a 5-reel, 3-row, 15-payline video slot with a Jackpot Game with 5 different Jackpots, 2 Bonus Games, Avalanche™ feature, Free Falls, Scatter symbols and Wild substitutions. The game is played with 15 bet lines (fixed), 1-10 bet levels and coin values from € 0.02 up to 0.50. Wild: Wild symbols can appear randomly anywhere on reels 2-4 only and substitute for all symbols except for Scatter symbols. In the main game and in Free Falls, the symbols fall into position on the reels, instead of spinning. A winning bet line will start an Avalanche. All symbols in winning combinations apart from Scatters, light up and disappear, leaving space for a second Avalanche of symbols for a chance of bigger wins. Scatter wins are valid only once during the Avalanche feature. The Avalanches continue until there are no more wins. 3 Scatter symbols appearing randomly anywhere on the reels in the main game only, activate 10 Free Falls. Each additional Scatter in the main game only, activates an additional 5 Free Falls. In Free Falls, all symbols on winning lines are transformed into marbles. The number of marbles collected is shown on the display panel. A Free Falls Bonus Game is activated if any marbles have been collected. The Bonus starts at the end of Free Falls. In the Free Falls Bonus Game, the marbles won cascade down through the Bonus game, and can land randomly in a Coin Win Cup or the Jackpot Collector Cup. The chance of either landing in a Coin Win Cup or the Jackpot Collector Cup, or of missing the cups is equal for every marble. Marbles landing in the Coin Win Cups award coin wins. Marbles landing in the Jackpot Collector Cup are collected and displayed on the Jackpot Meter. If 3 marbles are collected in the Jackpot Collector Cup during Free Falls, the Jackpot Game is activated, starting after the Free Falls Bonus Game. At the start of the Jackpot Game, 50 marbles will fall through a Bonus Game and can randomly activate a coin win and/or win one of 5 different Jackpots. The Jackpot Game has 4 Coin Win Cups and 5 Jackpot Collector Cups. If a marble lands in the same Jackpot Collector Cup 3 times, that Jackpot is won. Each Jackpot Collector Cup has a meter, which increases with every marble that lands in the cup. Marbles landing in the Coin Win Cups award coin wins. The larger the size of your bet the higher your chance to win a progressive Jackpot. 3.3% of the bet is contributed to the MEGA Jackpot. 1.4% of the bet is contributed to the MAJOR Jackpot. 1.0% of the bet is contributed to the MIDI Jackpot.